In a series of news updates for World TB Day (24 March 2018), The Foundation for Innovative New Diagnostics (FIND) has confirmed its ongoing partnership with 42 Technology, Rutgers University and the University of Cape Town to develop a disposable Stool Processing Kit (SPK) to help improve the diagnosis of paediatric tuberculosis (TB). TB is particularly difficult to diagnose in children and babies as the most commonly available tests are done on sputum, which most children cannot produce. To address this challenge, the SPK is being developed as an accessory for sensitive molecular TB tests, such as Cepheid’s Xpert Ultra assay, enabling the tests to be used routinely on more easily accessible stool samples. 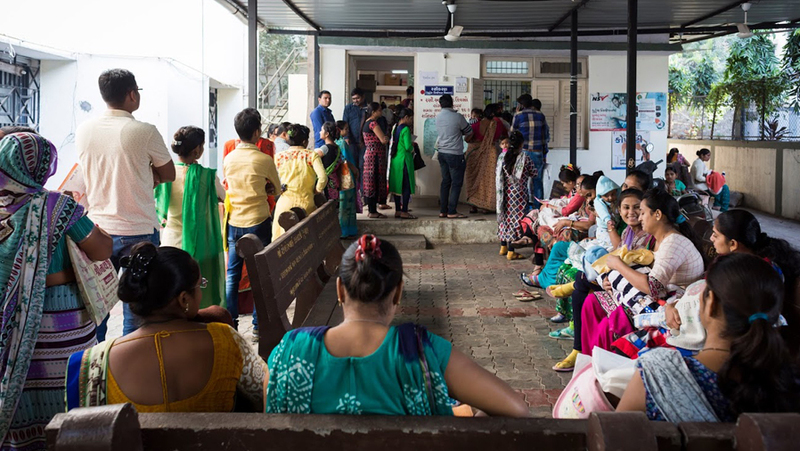 Parents, children and babies waiting to be seen by TB medical staff outside the Hirabaug Health Centre in Surat, India. Image credit: FIND/Ben Phillips. FIND has also announced a new agreement with The South African Medical Research Council (SAMRC) that will see the organisation provide funding for the South African arm of clinical trials for the SPK. Download the FIND/SAMRC announcement or visit FIND’s website for more detail.